A flakey and fruity pastry that’s perfect for every night or to impress your guests on special occasions! The recipe is courtesy of Daniela Abel. To Prepare the Pastry: In food processor, combine flour, sugar and salt. Add butter and carefully toss	to coat in flour mixture. Pulse until butter is about the size of peas. Turn processor ON and gently add ice water. Pulse as needed until dough forms. Scrape dough onto lightly floured surface and roll into a ball. Cut in half and form 2 flat discs. Wrap with plastic and refrigerate for 1 hour. Roll dough into a 10–12 inch circle on lightly floured surface. Transfer dough	to a baking sheet with parchment paper. For Pastry Filling: Combine apples, dates, flour, sugar, lemon juice and honey in small mixing bowl. Set aside. For Pastry Topping: In food processor with steel blade, combine flour, sugar, salt and Grana Padano. Pulse until well incorporated. Add butter and pulse until mixture is crumbly. Remove from processor and hand mix mixture to form small, individual spheres that hold together. To Bake Pastry: Pour pastry filling mixture onto center of dough. Sprinkle filling with topping. Gently fold border of pastry over the fruit. Some fruit center will be exposed. 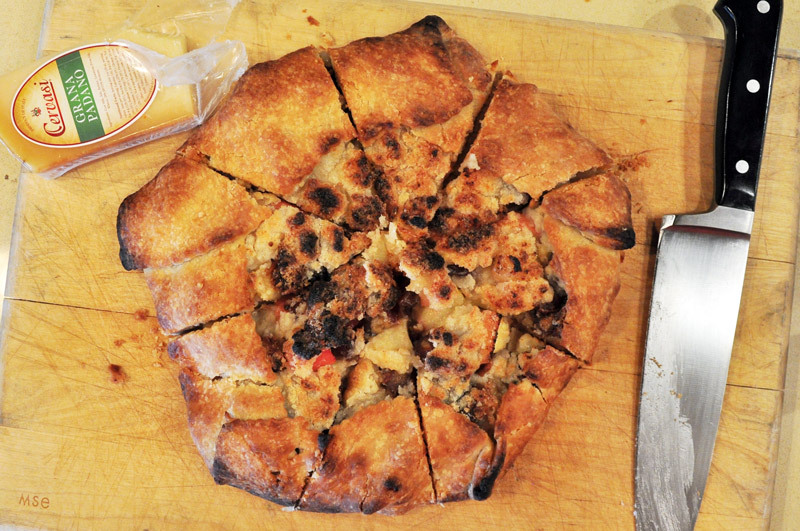 Bake Crostata at 450°F for 20–25 minutes, or until crust and fruit is golden. Cool for 5 minutes on wire rack. Serve at warm or at room temperature with a scoop of vanilla gelato. Note: Filling and Topping quantities are for one Crostata. Double Filling and Topping recipes to fill both dough portions.